Home » Internet Email » How to make email id easier to remember? How to make email id easier to remember? We often require to provide our email id to our customer\recruiter etc. so that they can send their requirement, document etc. to us. But sometime we find that someone sends an email to us, but we didn't get it for some reason, later it is found that the email is undelivered because the sender typed our email address incorrectly, this causes delays in the communication. Wouldn't it be great if your email Id is short and easy to remember, well to achieve this you do not require to create new email id, what need to be simply done is add an email alias, by doing this you will have one original id and another will be alias id, don't worry their will be no separate password for alias id and also you will receive all emails sent to your alias id into your original email id. Log-In to your Hotmail/Outlook/Live Email Id. Click here to know further steps as specified in this Microsoft article. Google seems to be offering email alias feature to only Google Enterprise customer, so if you are enterprise customer then you can click here for detailed steps. Log-In to your Yahoo Email Id. Click here to know further steps as specified in this Yahoo knowledge base (KB) article. to create email alias for email id by name which you want it to be. Similar options should be available for all other popular and free email service providers. 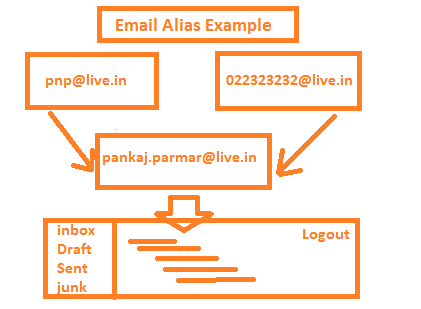 Email alias examples: your mobile number@gmail.com (9000090000@hotmail.com), your business name@hotmail.com (jesoba@hotmail.com), other name@hotmail.com (pnp[At]live.in). Doing this will help stop email delivery failure issues caused by incorrect email address. I would suggest everyone to like, share this idea so that it becomes easier to communicate our email id and avoid the chances of email getting undelivered.